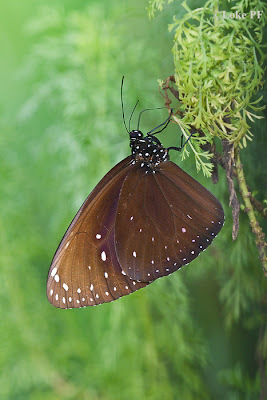 The King Crow is the largest of the "crow" butterflies from the sub-family Danainae. Measuring over 100mm in wingspan, this species is relatively common in Singapore, and sometimes several individuals can be observed, particularly when there is a flowering tree or shrub that the species likes. It can usually be found where its caterpillar host plant, the Pong-Pong tree (Cerbera odollam) is cultivated. In Singapore, this species can regularly be observed at the Pasir Ris Park Mangrove Walk where the host plants are common in the mangrove environment. This shot of the King Crow was taken by ButterflyCircle member Loke PF during his weekend outing. 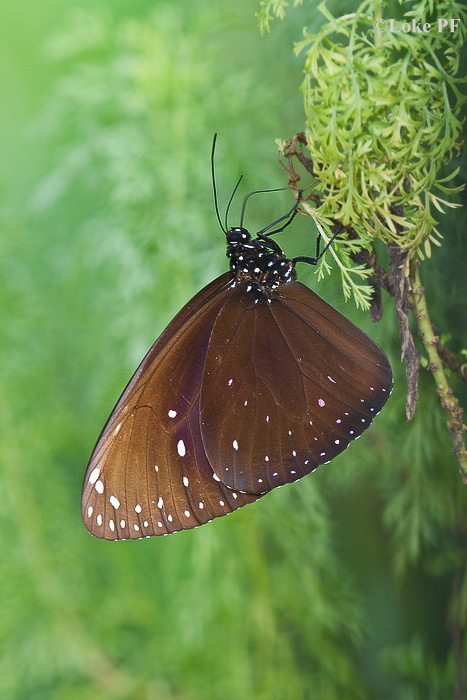 The predominantly black butterfly has a slow and unhurried gliding flight. The wings may show a slight purple wash in a side light.